WILLIAM SEARS RIGGS, a MORMON SHOOTER and CLUBBER, a pvt. 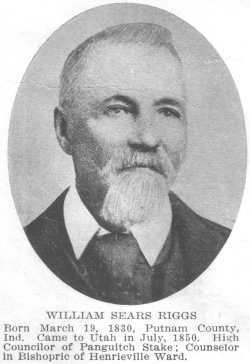 in the Iron County Militia; (son of John Riggs and Mary Gillman of Indiana) Born March 19, 1830, in Putnam county, Ind Came to Utah July 1850. Married Sarah Reeves Feb 7, 1855, at Cedar City, Utah (daughter of William Reeves and Frances Long of England) She was born Sept 28, 1837 Their children Sarah Frances, m E W Littlefield, Mary Elizabeth, m David C Wixom, Malissa Ann, m Joseph S Ingram, Caroline Jane Emma Lovina, m Joseph E Griffin, William Reeves b May 22, 1865 m Priscilla S Barnhurst, Andrew Jackson, m Christena Henne, Amanda Ellen, m Ernest A Griffin, Malinda Isabelle, m William H Bryce, Roselia m Frank Ahlstrom Family resided Kanarra and Panguitch, Utah. High Counselor of the Panguitch Stake ; Counselor in Bishopric of Henrieville Ward. Carpenter.